Sorry for the shoddy picture but you get it - there was juice, lots and lots of juice.. I love juicing. There is something about consuming nothing but liquid for three to five days that makes me feel as though I have will power, not to mention the fact that it makes me feel skinny, mostly because I'm not eating. I have tried several juice-based programs in the past and the experience has not always been pleasant. The problem for me is that I live in the middle of the FN country, so I have to pay stupid money to have juice pressed the night before and then dropped off at my doorstep. Which I'm totally willing to do, as long as the company is great and not snobby jerks, a trait I don't take kindly to. I know that it would make more sense to just make my own juice (which I plan to do once I have a million dollars to spend on a juicer) or purchase locally, but if you have ever juiced before you understand the need for convenience. 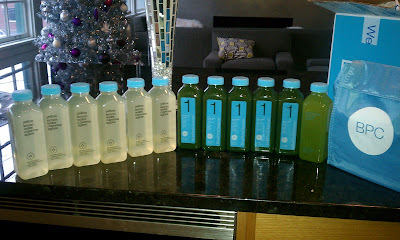 A friend told me about the Blue Print Cleanse and she loved it so much that I decided to give it a try. It didn't hurt that I have heard that many celebs (Oprah included) use this system to detox or drop lbs fast. There are many different cleanse options to choose from that are pre-marked 1-6 in the order that you are supposed to drink them in throughout the day that run around $250. I went the less expensive route and purchased a case of their very popular Spicy Lemonade and a case of the BluePrintGreen which cost roughly around $150 with shipping. There are 6 bottles to a case, so I had 12 juices to drink over 3 days. I drank a green first thing in the morning, two Spicy Lemonades during the day (yum) and then a green 2 hours before bed. 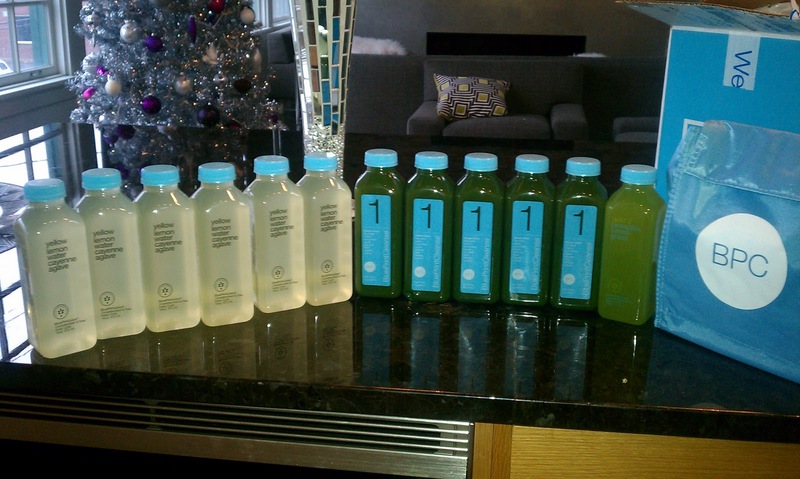 Drinking four juices a day was plenty for me; you would maybe have to take time off of work in order to consume six. After 3 days I feel fantastic. The first day is always awful, but by the third I am not hungry, my skin looks very "glowy" and I have lost about five pounds. The weight is not what I was going for though - you pretty much gain everything back once you start eating again. I was feeling very bloated and gross after Thanksgiving from the vast amounts of cheese and wine that I consumed so I wanted to cleanse before Christmas parties began. I would highly recommend this company, loved the juice and, bonus, you get a cute blue case to tote your liquids around in! Rayyychhh , I am so trying this. Thank you for blogging about this. FYI --- I miss you !